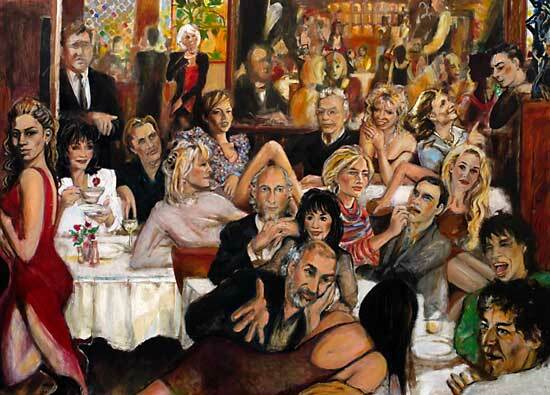 Supping stars: Ronnie Wood’s depiction of regular clebrity diners at The Ivy is on epart of a triptych. This unfinished section, along with two other panels, will eventually feature 60 well-known faces. If you have ever wondered why it is so difficult to get a table at the Ivy, here at last is the answer: it I s because this lot are always there. Sir Mick Jagger hobnobbing with Sir Tom Stoppard, Joan Collins hanging out with society jeweler Theo Fennell, not to mention Jerry hall, AA Gill, And Kate Moss Showing an Awful lot of leg… the place is positively awash with famouse faces. This is the first publication on one of the more eagerly awaited artworks of recent years, Rolling Stone Ronnie Wood’s depiction of 60 celebrities who are regular diners at what is arguably London’s premier show-business restaurant. The detail shown here is one part of a triptych. The other tow panels, each measuring 5ft, by 6ft, feature Sir Elton John, Naomi Cambell, Melvyn Bragg, Salman Rshdie, Mariella Frostrup and Lulu – aparty planner’s fantasy but just a regular Monday night at the Ivy, if Ronnie Wood is to be believed. Is this really what The Ivy is like? if so, it seems like a very jolly place. AA Gill’s girlfriend Nicola Formby appears to be force-feeding him (perhaps he does not like the food), jerry Hall looks very youthful and Alan Yentob seems to be engaged in earnest conversation with a curvaceous brunette who is, for some unexplained reson, sprawled over the table in front of him. The picture was commissioned by Lord Lloyd Webber more then tow years ago in an attempt to revive the neglected Victorian art of creating panoramic social scens. He said he hoped it would be ready to hang as part of an exhibition of his art collection – titled pre-Raphaelites and other Masters – at the Ryal Academy in September. Ronnie Wood went to Ealing Art School before he became a rock’n’roll star, and has painted portraits of a variety of musicians over the years. His work has been shown in Britain, Japan and America.